Location. Barns were sited close to fields but not on them, for obvious reasons: a farmer would not want to construct a building on or in a field that was tillable (could be farmed). Many San Juan County barns are therefore located adjacent to agricultural fields, on patches of ground that are rocky (literally ‘outcroppings’) or in other ways untillable. This also allowed for drainage, so that the barn structure did not sit in waterlogged soil during the winter. Furthermore, many barns are sited on (rocky) prominences—small hills or elevated areas or on slopes of valleys—that enjoyed a visual ‘command’ of the surrounding fields. In the early days of EuroAmerican settlement, this allowed the homesteader to observe the approach of any hostile forces such as northern Native American raiders. Later, siting a farmstead on a prominence afforded the farmer the opportunity to be able to plan and deploy his forces for work on the farm. Topography. Some barns took advantage of the relative topography of the farm sites in order to provide access to separate functions in the structure. For instance, some barns, called “bank barns,” were built parallel to a moderate to steep slope, so that entries at different elevations could access separate levels of the structure. 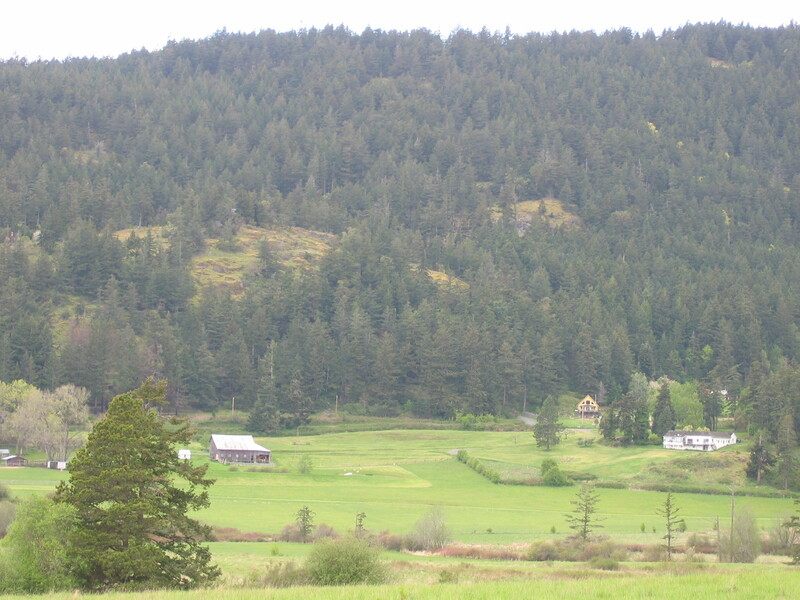 This is the case of the Schmidt Barn in Crow Valley on Orcas Island, a center-drive plan that is accessed on the upper part of the slope, while the entry for dairy cattle is lower down the slope on the opposite side of the barn. A similar example is the Hudson dairy barn in San Juan Valley, although in that case the access to the hay loft is in the gable end opposite the lower dairy entry, but at a higher elevation. The Apple Barn, also located in Crow Valley, is sited perpendicular to the slope, so that the upper floor is accessed on the upper slope, and a ground-level doorway leads into the stone basement/lower floor. Orientation. While it is still not clear what the full reasons for siting barns in the San Juan Islands were, certainly orientation was an important factor. The vast majority of barns are oriented according to the cardinal compass points: most north-south, with a significant minority east-west. Weather may have a factor in this. The prevailing winds in the region are generally from the south or southeast in the winter and west or northwest in the winter, although specific geography may affect local conditions. Wind direction would affect both the prevailing rain pattern, in which case the location of entry doors or hay doors and hoods away from driving rain is significant. (One expert, on the other hand, recommended the location of the hay door on the north gable side of the barn because it offered welcome shade in the hot summer months of haying!) Another factor is wind shear: the ‘broad side of a barn’ presents a massive surface that must structurally resist normal and on rare occasions even gale force winds. The siding was often constructed so that gaps allowed the passage of wind into the mow or loft areas for ventilation. Some barns may have taken advantage of prevailing winds for blowing off chaff during the threshing process in side-entry or center-drive barns. With the threshing floor located in the center drive as well as the bay adjacent to it, the doors on both sides could be kept open, allowing the breeze to blow through the aisle, taking the lighter chaff and leaving the heavier grain. Relation Among Farm Buildings. As a complex, farm buildings were often arranged to take account of sanitation and convenience. Barns, which often housed livestock, were located downwind from dwellings, and manure was taken from the sides of the structure away from other, cleaner operations as well as fresh water sources. If there was a dairy operation, milk was carried in buckets or pails to a nearby milk house. Access of farm products to transportation by means of farm lanes was also important. Livestock needed to have ready access to yards and pastures. Relation among the various farm buildings was also important. Farm equipment had to be able to maneuver in between the buildings: hay was delivered to mows and lofts; root crops to cellars; animals to pasture and back.